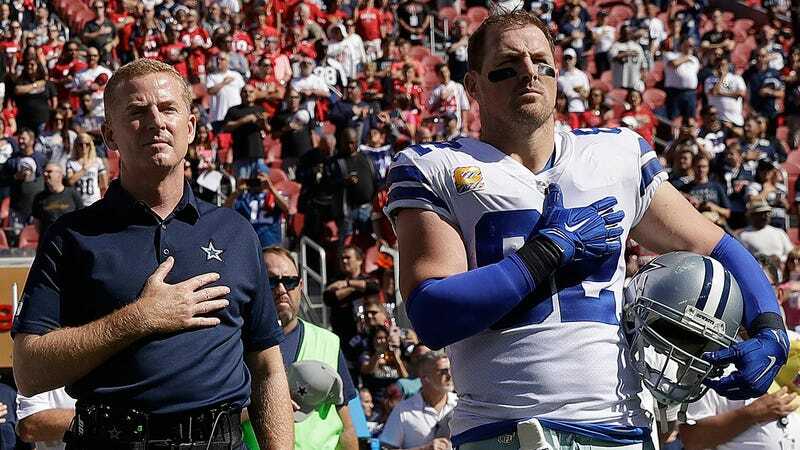 Jason Witten retired in May after 15 NFL seasons, leaving for a job as a color commentator on Monday Night Football. Jason Garrett has apparently been trying to get him to un-retire. The Cowboys are first in the NFC East, but their top tight end, Geoff Swaim, has only 26 catches on 32 targets. He averages three catches for 27 yards per game, a bit behind Witten’s four-catch and 35-yard averages last year. But, for football fans, the real excitement here is the possibility that Witten could’ve been removed from Monday Night Football! Not a week goes by that Witten isn’t pilloried by media and fans. Jason Garrett has apparently been watching Monday Night Football, too, and he wanted to make it a little better for everyone. What a guy.